First, Veeam Backup & Replication 9.5 Update 2 is available for Service Providers to download and update their environments. Second, I’ll begin by saying that this just simply a product UPDATE, not a major release or even a minor release, its an update. I’m truly impressed by the awesomeness that just an update provides – kudos to Anton and the RD team! My colleague and very good friend Anthony Spiteri details this latest update over at Veeam.com/blog. Veeam releases their product updates first for their Veeam Cloud & Service Providers (VCSP) partners first. This allows the partners the ability to update their infrastructure first before their tenants can. I’ve had the ability to update my on-premises and Azure based lab environments to this latest update and here’s my quick first take. Just like all things Veeam – the update “Just Works” – Once you download the update from the Veeam website it’s really easy to update. 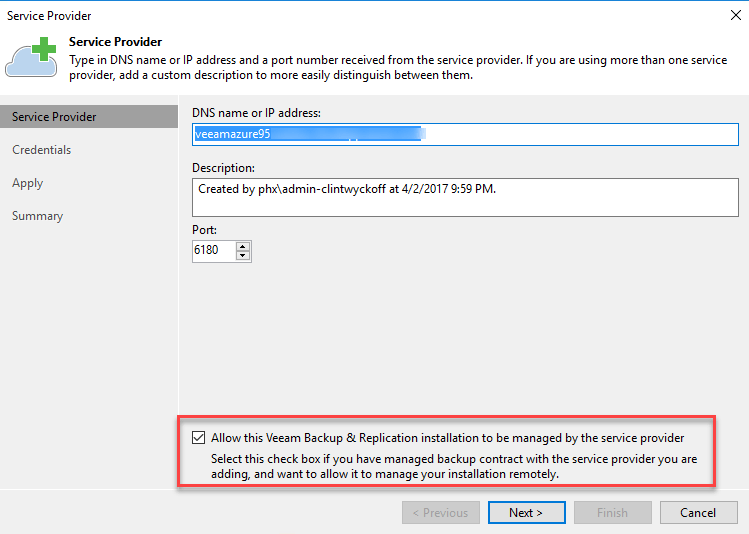 During the installation you’ll notice that you have the capability to update all of your Veeam Backup & Replication components as part of the installation (via a checkbox) instead of updating your Proxy Server and Repository Servers after the installation is completed and the console is launched for the first time. If you choose not to update these components as part of the installation you’ll be prompted upon first launch of the console – like you’re familiar with. 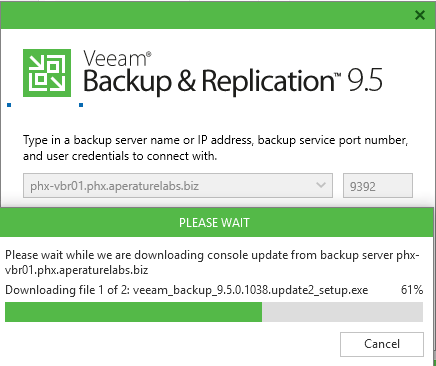 If you’re utilizing the Veeam Backup & Replication remote console to connect to your VBR environment, you’ll be prompted to update your console upon first launch. So what’s new in this update? Well the first major portion of this update is that Veeam Backup & Replication is now poised to provide full support for the upcoming Veeam Agent for Microsoft Windows 2.0 (VAW). Several performance enhancements have been added Veeam’s flagship product to support the General Availability (GA) of their latest product. More to come on this once VAW is GA.
Update: Veeam Agent for Microsoft Windows 2.0 RTM is available as well. The biggest addition to VBR 9.5 Update 2 is for the users of Cloud Connect. Cloud Connect allows Managed Service Providers (MSPs) or Veeam Cloud Connect for the Enterprise (VCC-E) the ability to offer BaaS or DRaaS for their tenants without the need for a direct connection or VPN. 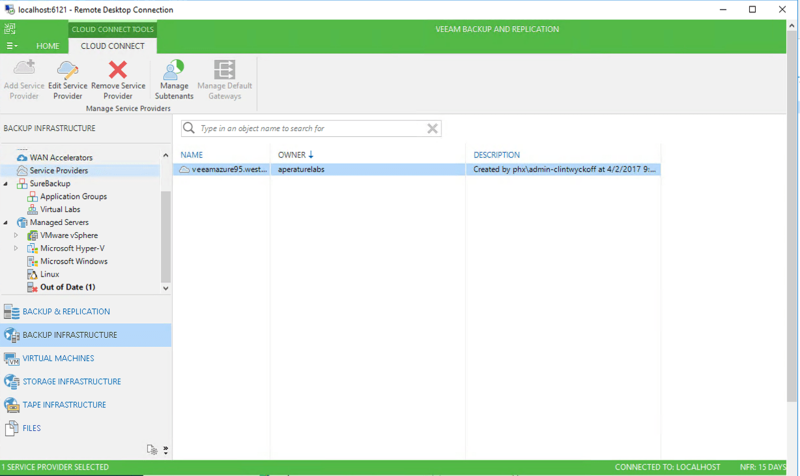 With this latest update the Service Provider can now initiate a remote Veeam Backup & Replication console OR Remote Desktop connection to their tenants Veeam server. The remote console provides the Service Provider the ability to completely control their tenants Backup & Replication environment! COMPLETE CONTROL & VISIBILITY…From a tenant perspective its really simple to enable this too…just check the box “Allow this Veeam Backup & Replication installation too be managed by the service provider” when you’re adding the VCSP to the environment. The second option for the tenant and the SP is the ability to have the SP initiate a Remote Desktop connection to their Veeam Server – again, it’s super important to note that there is absolutely zero requirement for any VPN or direct connection between the sites. That’s the beauty of Cloud Connect – all of the traffic is secured via a TLS connection and traverses a single port – 6180. Now the SP can manage the VBR instance as well as the operating system that VBR runs upon. This unlocks many new options for the SP – true end-to-end management of their tenants Veeam Backup & Replication environments. Just imagine the options; they’re endless! The SP can not only just manage the VBR environment, this is the jump box into the environment! Truly impressive! Service Providers now have the ability to capitalize on the investment they’ve made in Cloud Connect while Tenants will benefit from having their environments be available 24x7x365 without ever even having to lift a finger! Veeam Backup & Replication 9.5 has been available for months – Update 2 is set to unlock several new enhancements that tenants and Service Providers will both benefit from. Once the update is readily available for open download you’ll want to dead over to the Updates section of Veeam.com to grab your copy of the latest update for Veeam Backup & Replication!